I would love it if you would head over to The Estella Society today and read my post on Christopher Paul Curtis' The Watsons Go to Birmingham -- 1963. It's a wonderfully vivid chapter book focusing on a turbulent time for African-Americans that is a must-read for all ages. Here, I'll introduce you to two fab picture books. Written by Kareem Abdul-Jabbar and Raymond Obstfeld, What Color is My World? 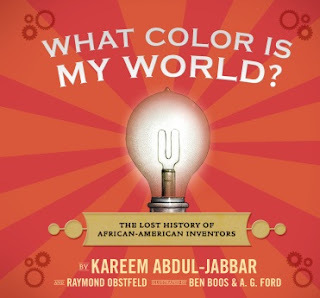 The Lost History of African-American Inventors is a picture book that links a modern-day family's everyday life with oft-ignored scientists and inventors. Ella and Herbie (fantastic jazz names!) are twins who are moving into a new home that isn't so new after all -- in fact, it's somewhat shabby. They complain a bit about the house before meeting handyman Mr. Mital, who is left in charge of them while their mom goes out to run errands. Mr. Mital is not only handy but is a font of knowledge about African-American inventors. The kids come to appreciate how difficult it was for inventors and innovators of color (and also for women and younger inventors) and we get quite a few fantastic examples of pioneers, both historical and those who are making technological advances in our world today. Just like the twins, before Mr. Mital's lectures, I could have named just one African-American inventor, George Washington Carver. But now I know more about these remarkable men (and women) and the hardships that they endured simply because of the color of their skin. They were denied educations, were passed over for jobs and so much more. But they persevered, sometimes even using a white front-man to ensure their important discoveries were used and shared. The story that stuck with me the most was probably that of Dr. Percy Julian who fought to become a chemist, eventually having to leave the U.S. and study in Europe because of prejudice against him. When he returned, he began his research on synthesizing drugs, including finding a cheaper way to produce cortisone from soy plants. Dr. Julian sadly died the day before I was born in 1975. RIF (Reading is Fundamental) has free downloadable teaching guides and activities on their blog that pair with this book but even sitting down and simply reading this book with your children or students will hopefully make a difference in how they view the scientific and technological contributions of African-Americans. I first saw this book at the airport in Honolulu last year but didn't get a chance to look at it. But, having spent a few years of my childhood in Hawaii just like President Obama did (same island, different part), my curiosity finally got the best of me and I got a copy of A President From Hawai'i by Dr. Terry Carolan and Joanna Carolan. 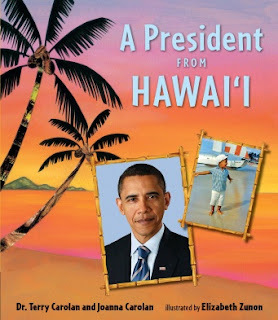 This colorful book is a collection of quotes from Obama's pre-Presidential days, some Hawaiian history, lore and language, and photos of the President as a young man and an adult on the islands. It's a fun little book that highlights important Hawaiian values and customs. In fact, it is more a book about Hawaii than about the President but that's okay. With intricate paper cut illustrations by Elizabeth Zunon, this would be a great book to give to kids before a trip to Hawaii or just as something to brighten up a dreary midwinter day. What Color is My World sounds fantastic, as does The Watsons go to Birmingham. I'm so glad that there is more children's and YA literature devoted to POC. I like that there are more stories that represent ALL lives too. If kids can't find a story they connect with, they may just not read and that would be sad. Great reviews! 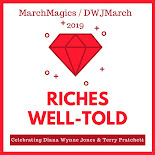 I recently read What Color is My World and thought it was a delight. I didn't know about many African American scientists before this book either. My son's teacher is reading their class almost everything Curtis has written. The Watsons Go to Birmingham is one of his favorites. I'm going to make sure Z's school library has What Color is My World. It presents information that could be kind of dry in a really interesting way.